Cancer Bats in Montreal or Quebec City? Inform me about the next events for Cancer Bats. Enroll yourself to our priority waiting list for Cancer Bats to be alerted when new tickets are available. Filling this form doesn't engage you to any purchase. Cancer Bats impressed quite a few people on March 24th, 2010, as they opened for Billy Talent at the Bell Centre. 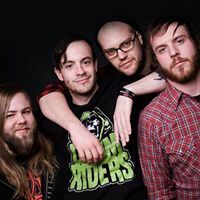 Cancer Bats' latest album Bears, Mayors, Scraps and Bones wasn't available back then but the fans have heard it since.